This grade 1 listed Abbey is idyllically set in the Golden Valley near the Welsh borders. Founded in 1147 by the French Cistercian Monks from Morimond the Abbey survives today despite the advances of Owain Glyndŵr in 1405 and Henry VIII in 1547. Many alterations and adaptations have been made to the Abbey over its lifetime but it remains a magnificent building still holding regular services and events. Jones and Fraser were enlisted for their rope access skills. This avoided the expence of using scaffolding to carry out routine roof maintenance on various locations around the roof. 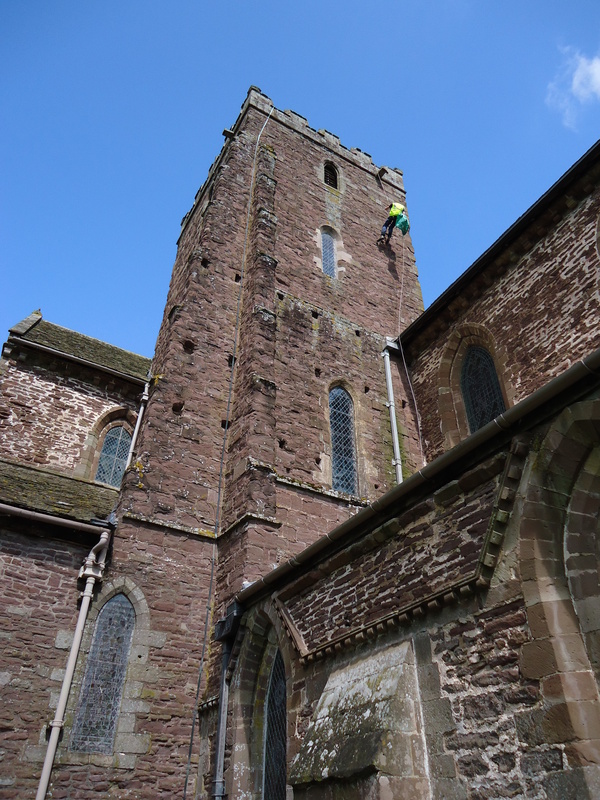 A full condition survey of the stone tile roof was also carried out. More recently, Jones and Fraser have conducted repairs to the boundary wall of the Abbey. This consisted of 20 meters squared, of rubble walling, to match existing boundary wall. Emphasis was put on minimal disturbance to the sensitive surroundings, as well as storing and documenting the discovery of any notably dressed or marked masonry found in the wall.